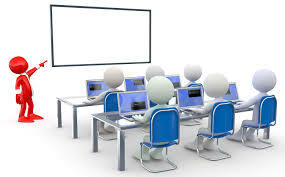 To study the force on a current-carrying straight conductor in a magnetic field and to verify that the motion of the conductor is according to Fleming’s left-hand rule. 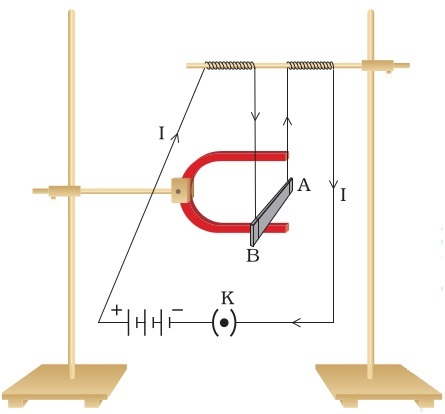 A current carrying conductor placed in a magnetic field experiences a force. 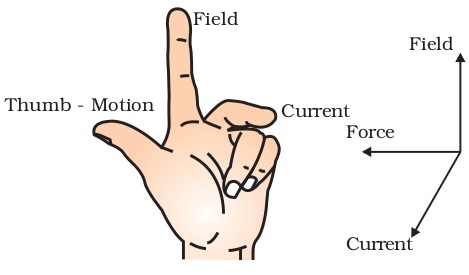 If the direction of the field and that of current are mutually perpendicular to each other, then the force acting on the conductor will be perpendicular to both and that can be determined using the Fleming’s left-hand rule. When current establishes in the conductor, it gets displaced which verifies the existence of a force on the conductor. Hold the thumb and the first two fingers of your left hand mutually at right angles to each other as shown in Fig. (2). Then if the Forefinger points in the direction of the Field, and the second finger in the direction of the Current, the thumb will point in the direction of Force. 1. Suspend the aluminium rod horizontally from the stand using clean connecting wires. 2. Place the horse-shoe magnet in such a way that the rod lies in between both the poles such that south pole is vertically above and north pole is vertically below the rod. 3. Connect the rod in series to the battery, key and the rheostat. 4. Now switch on the current and observe the displacement of the rod. 5. Reverse the direction of the current and observe the change in the displacement of the rod. On passing current through a straight conductor (aluminium rod) kept in a magnetic field, the conductor gets displaced upward or downward. 1. The direction of displacement of the conductor rod changes with the change in the direction of current through it. 2. The displacement of aluminium rod is in accordance with Fleming’s left-hand rule.